One murder made a villain, millions a hero. Princes were privileged to kill, and numbers sanctified the crime. "Death" line 154 beilby porteus. It is said that a man is to be judged by the quality of his enemies. Your agents deserve to be the best and we're here to help! Collected within is the ultimate gallery of scoundrels, masterminds and murderers, perfectly suited to test the determination of the world's finest intelligence operatives. Put the control back into game control! 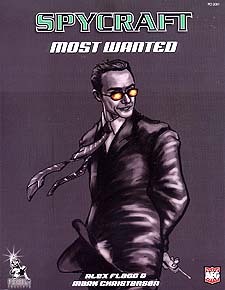 * Torment the players of your Spycraft season with 17 complete villains: Complete agent briefings to pass on the information your players would have. Complete Game control briefings to reveal the information your players wish they had. Serial and season hooks to easily set your agents against the villain. Statistics designed to oppose parties of all levels. * Test our agents' mettle with an all-new class: the Terrorist. * Make your villains even more villainous with a dozen new feats. * Add to the menace with eight new threat resouces. * Further refine your villains with new agendas. * Make agents quake in their boots with an all-new system for reputations and notoriety.